Getting a firearm isn’t that difficult (let alone to shoot :p ), taking care of it is the key of having it for a very long time. No matter how great your firearm is on the shelf it still needs cleaning from time to time as it may cause malfunctions. In addition, we all know how great of a shooter you are! In order to get to clean your gun, you do need to know something about it. For instance, in the case of semi-automatic pistols, you would need to break it down to its major components. If you own a single action revolver, you simply remove the cylinder from the frame. How often you should clean your firearm? Well, some models need a good clean after each shooting session so you need to always have cleaning supplies. What makes a good gun cleaner? Some gun cleaners work on various types of metals, which is so great for the versatility. Some cleaners need to be poured onto a brush, whereas some come in an aerosol container. Therefore, its form should fit your needs in order to be the best choice for you. Want to play it safe? Get a gun cleaning kit as it comes with all the brushes, swabs and various accessories you need to properly clean your guns. How often should you do it? Well…scroll up. Firearms need to be lubricated with oil wipes (or something similar) in order to shoot right (if you’re aim is right!). Don’t forget about the gun-cleaning mat that doesn’t absorb oil in order to get the best results either! We all hear about the precision and quality of anything that comes from Germany but we don’t really buy it until we tried it. Leave your bitchy resting face and give it a go with the Ballistol Multi-Purpose Aerosol Can Lubricant Cleaner Protectant that was created for the German Army as an oil that lubricates, cleans, protects and takes care of the firearms, gunstocks and even leather gear. The lubricant is a great option to clean your firearms and minimizes the need for scraping barrels and chambers or brushing just as well. It works great for trim or grip components and protects all the way your firearms. The versatility of the lubricant is notable as you may safely use it on wood, leather, plastics and metal just as well. Moreover, if the list of things you need to clean is also silver and brass polish, it’s only for the better. The list of good things doesn’t really stop here and we definitely need to mention the lubricant is biodegradable and doesn’t damage the environment. Along with this quality, comes the fact the lubricant is a bit alkaline thanks to its pH so your skin oils are neutralized. Being safe for your skin is an important quality for any gun cleaner, you know. The lubricant forms a protective film on the surface of metals and is able to reach into the thinnest cracks and fissures, so it’s an efficient “penetrant” that helps loosen frozen bolts and nuts. Unlike many lubricants out there, this one protects even the wet surfaces and actually emulsifies with water as the water evaporates. Highly efficient, versatile and biodegradable, the gun cleaner is a sure option anytime. Even though it has a kind of foamy texture that may not be to some people’s taste, the Break-Free CLP-2 Cleaner Lubricant Preservative is no less efficient and that’s what matter the most for a gun cleaner. The lubricant is efficient enough, really penetrates, and works on the entire metal surface, getting into every crack, crevice so it eliminates contamination. It gets the residue away, where you can easily remove it. Apart from its efficiency, we also notice the long lasting effect as the lubricant minimizes adhesion of sand, grit or other abrasives that enhance wear and failure. The lubricant is full of corrosion inhibitors that protect from rust and the Break-Free film keeps at distance moisture or other contaminants. The Break-Free CLP quality of the lubricant recommends it in three efficient ways: effectively clean, lubricate and protect metal, simultaneously. The Break-Free CLP quality is in fact recognized all over the world as a standard that ensures maximum metal performance and protection. You may easily use the lubricant in any weather or environment conditions. It’s special formula doesn’t change its viscosity (the lubricant doesn’t dry out nor stiffs up in extreme environments), no matter how cold, hot, dirty, humid or even salty the conditions get. As a matter of fact, the lubricant is made to perform in temperature ranging from -65F to +475F and in case of saltwater immersion also. To sum it all up, the oil-based lubricant dissolves wax and grease and flushes out debris. It’s very easy to apply and even breaks free carbon buildup. A little goes a long way and the lubricant is reliable all the time. All in all, for a good price, you get an efficient, versatile and reliable lubricant that works even in the most challenging environments. Strong and efficient, the Gun Scrubber Synthetic Safe Cleaner is a gun cleaner that sure doesn’t disappoint. It’s better to be prepared when using it comes out at high pressure. The degreaser sure cleans all dirt and fouling and air dries instantly. It’s strong, keeps nice, and clean all firearms that you own. The synthetic safe cleaner doesn’t bring any damage to plastic, wood, composites, rubber grips, other various materials used on your firearms. It works fast and removes even the most stubborn build-ups. The cleaner is very easy to use and you simply spray it down on surfaces. It’s not a traditional gun cleaner and you may be surprised at first on how fast it works. The only tricky part related to the gun cleaner is that you need to also use a bore cleaning solvent along. In addition, you have to lubricate the gun afterwards as the cleaner does take away the oils from the gun (that strong it is!). You may use the gun cleaner for plastic guns also, which makes it for the lubricating part. Despite the few issues, we are happy with the gun cleaner and we think it makes it as a dependable option. Are you only looking for a gun cleaner as you already have a lubricant for your gun? Alternatively, are you the type that really doesn’t buy the “do-it-all in one step” type of gun cleaner either? You should go with a gun cleaner that only cleans very well your gun, like the Outers Nitro Solvent Gun Cleaner. The gun cleaner includes gun care chemicals, which makes it highly efficient and reliable for gun cleaning. It offers fast and easy protection for your gun, increasing its accuracy and overall performance. The non-acidic strong bore cleaners is able to remove carbon build-ups, gunpowder and loosens lead just as well. Even though it’s strong, it leaves behind a light layer of oil, protecting your gun just as well. A little goes a long way so the gun cleaner should get you covered for a very good amount of time. It comes also with a straw to attach to the nozzle. It’s not difficult to get in the tight areas anymore. The cleaner doesn’t wear a bad smell and is very easy to use thanks to its spray. The pressure is powerful, which makes it so efficient. It works on so many types of guns, which makes it so versatile. All things considered, we think the gun cleaner is a fair option when you’re not looking for a complete formula to clean your gun. 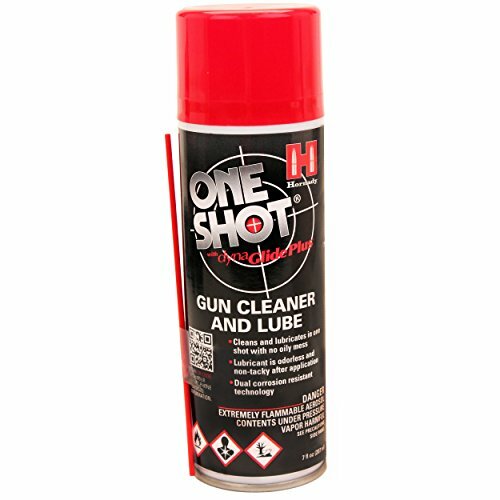 If you want a gun cleaner that is efficient without being messy, you can definitely give it a go with the Hornady One Shot Gun Cleaner. The formula of the cleaner is efficient and features DynaGlide Plus. This means the cleaner isn’t tacky and is able to clean and lubricate at the same time. Its formula minimizes risks for malfunction on your firearm, leaving a micro-thin layer of dry lubricant behind. The dry, non-tacky lube helps the smooth action of your firearm and keeps at distance mechanical fouling as the powder and dirt are picked up by the lubricant. The cleaner isn’t a silicone based dry lube, which doesn’t make it any less efficient. It sure doesn’t gum up as it has a light texture, which is an important thing to mention. The gun cleaner sure works great and, if you have some squeaky doors or shavers around the house, don’t hesitate to use it! You may be surprised with the results on that also! Nevertheless, as it cleans and lubricates at the same time, the gun cleaner sure makes it as a dependable choice in ever in need. Let’s face it: as much as we like shooting, cleaning your firearm isn’t a picnic and sometimes you may really not to feel like you want to do it. It may also be the specific smell of the gun cleaners in which case…problem solved! You may even enjoy cleaning your firearms when using the G96 1055P Complete Triple-Action Gun Treatment not because it’s easy to use it, but also because of the smell, it wears. The gun cleaner is not only wears a pleasant smell, but it also presents a triple-action and makes it as a fine, pretty much complete firearm product. You don’t need to worry about having to lubricate and protect your firearm afterwards, as the G96 treatment actually cleans, lubricate and protects your gun in a single step. It leaves an invisible magnetic film on all metal parts, keeping rust away from your gun. It also doesn’t leave gummy residue, which may happen in case of other lubricants. You need no solvent or preservation either when using the G96 gun treatment and this is so convenient for any of us! 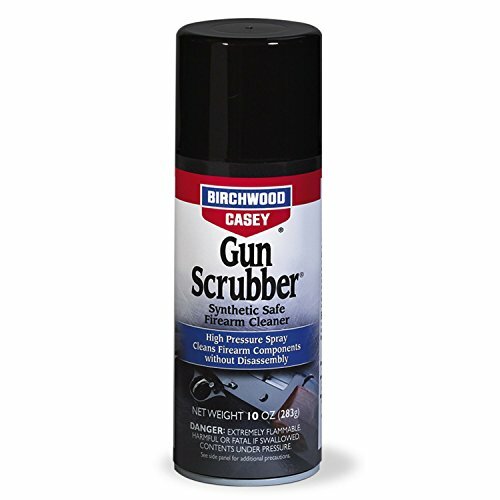 The gun cleaner removes rust, gunpowder, leading and corrosion immediately. Apart from being so efficient, the gun cleaner is also highly versatile and works on polymer, wood, laminate stocks, chrome lined barrels. The small nozzle makes it efficient for the small, little cracks also. You don’t need to worry much about the weather getting too cold or too hot as the cleaner doesn’t freeze, oxidize nor evaporate. The cleaner is so good that the firing pin and all moving parts still work in -50Degrees Fahrenheit. The cleaner is strong and is so easy to use. In addition, have we already mentioned the smell part? The minor issues don’t hold us back when seeing the gun treatment as it is: efficient, easy to use and…smelling so nice. Getting a gun cleaner that is complete isn’t that difficult anymore and there are actually several choice out there that you can trustfully try. The Clenzoil Field and Range Cleaner Lubricant Protector Gun Cleaning is definitely a good option as it cleans, lubricates and protects against future rust altogether. The protector gun is strong and efficient and works for all firearms, which sure makes it versatile. You may use it on a great variety of materials: leather, sport equipment, shop and even wood. It keeps rust, corrosion and moisture away from your firearms, without damaging. The gun cleaner is easy to use and there are many types of products that may benefit from it. You can keep nice and clean compound bows, knifes, gun holster, paintball guns, pellet guns and so on with the help of the CLeanzoil Cleaner. We like the cleaner for many things and the fact it doesn’t leave a layer of goop attracting grit and grime is just one of them. We definitely need to mention the cleaner doesn’t smell, not as bad as typically gun cleaners do actually. The gun cleaner is strong enough to loosen dirt and lubricates at the same time. Moreover, as it’s a product of a veteran owned company, it’s good to know that a portion of Clenzoil sales goes to the Paralyzed Veterans of America. Pretty generous, right? Never mind the parts we don’t really like though as, for a fair price, you get an efficient, dependable gun cleaner that also lubricates and protects. In addition, takes care a bit of our brave veterans. Give your gun a great clean with the M-Pro 7 Gun Cleaner. The cleaner works fast and manages to improve the precision and reliability of your firearm. The cleaner works as an efficient conditioner also and lowers future fouling. You can safely use the M-Pro7 on your firearms as it removes carbon, lead and most Copper fouling- which you always want from a gun cleaner. You can’t complain afterwards about missing a shot. The cleaner it is, the more accurate and dependable your firearm gets and that’s the whole purpose when using a gun cleaner. The list of good things includes also the bio-degradability of the cleaner. As it wears no smell, you can’t complain anymore when using the gun cleaner (not because of the smell, anyways). The way the cleaner works is what makes it so special and efficient. We’re skipping some steps and only highlight the fact the cleaner actually removes all the layers of carbon embedded fouling. This is fact an aerospace technology and that explains the efficiency. The cleaner is also non-flammable so you’re good also on safety part. Let’s not oversee the fact the lubrication lowers friction and wear, giving the durable corrosion protection. The minor issues aren’t deal breakers for us and the cleaner does a great job when it comes to cleaning your job. In addition, if you want it in a bigger bottle, simply get the 32-ounce option. You can’t call yourself a dedicated shooter if you don’t take care of your gun. Hell, you can’t call yourself a shooter unless you do it all the way, including taking care of your gun. Solve most of your gun problems with an efficient cleaner like the Hoppe’s Elite Gun Cleaner Spray Bottle. The cleaner is able to improve both precision and accuracy on your gun. It’s a cleaner made according to the requests of professional shooters, law and military enforcement. The cleaner really penetrates down to the steel’s molecular pores and removes lead, carbon and most copper fouling. It also conditions the metal to keep at distance future fouling. The cleaner wears no smell and is non-toxic, biodegradable and non-flammable altogether. You may safely use it on inside settings. It’s very easy to use the cleaner and some say you need less than 80% of time that you’d need with any other regular gun cleaner. As it cleans, protects and improves accuracy on your guns, the cleaner is a sure buy anytime. If you don’t want to buy several products to take care of you firearm, get the formula that does everything. One of this type of cleaners is the Gunzilla, “The World’s Best CLP” that cleans, lubricates and protects all kinds of firearms. The formula is highly versatile and works on smokeless, black powder guns, but you may also use it for rifles, shotguns, handguns and muzzleloaders. The cleaner works for bore and chamber. The cleaner is strong and may remove rust, lead, copper, carbon, cleaning also corrosive ammo. Another thing we like on the cleaner is the non-ionic coating it leaves behind. The coating is for lubrication and protection in the future. You may safely use the cleaner as it has no ammonia, has a non-hazardous formula and is non-flammable. The bio-based formula is in fact nice to use, as it wears no smell. As it takes of your firearms on all levels, it’s only up to you to get the right shot as the accuracy is highly improved when using the cleaner. Moreover, when you’re done, you can easily wash it out with some soap and water. A little goes a long way so the cleaner is a good buy for quite some time. Nevertheless, the cleaner gets your gun, no matter its type, clean, lubricated and protected from corrosion-, which is why you buy it in the first place. In addition, if you want to get yourself covered for a very long time, try the 16oz bottle. If it ain’t broke, don’t fix it. In addition, if it’s working, don’t change it, right? That seems the be the main principle for the Hoppe’s No. 9 Gun Bore Cleaner that hasn’t changed its formula since 1903 for a very good reason: it works just fine like this! If your grandfather used it, it means you can also use it, as it is a great, highly efficient bore cleaner for a very good price. The bore cleaner isn’t a lubricant, but it manages to remove powder and keep corrosion at distance just like any other lubricant would do. The bore cleaner is quite strong and is able to penetrate the tight cracks so that you’d have in the end a clean gun. Sure, if you want the best results, you need to let it soak a bit, but it’s totally worth the wait. The bore cleaner is easy to use and is a common and popular choice due to its efficiency and…price. It’s strong enough to clean every single part of the gun, as long as you let it work for a while. It melts carbon buildup and sludge so it gives you a clean gun in the end. The bore cleaner comes in large bottles so you sure have it around for quite some time. it’s versatile and you may use it for pistols, shotguns and all rifles. You may be a tad surprised when you use it for the first time due to its rather thick consistency, especially if you are used to aerosol sprays. Don’t forget though that the bore cleaner is out there for more than 100 years and there is a very good reason for it: its efficiency. In addition, if you have kids around, you need to leave your worries away when using it. The bore cleaner comes with a childproof cap, which means safer use all the time. As you can see, the drawbacks aren’t major at all which explains the popularity of it for more than 100 years.